There are only four species of cool season grasses that are capable of producing an acceptable dense turf in New England. The four species are Kentucky Bluegrass, perennial ryegrass, fine fescue, and turf- type tall fescue. Of these, the most widely used are the Kentucky Bluegrasses. Before deciding upon which grass would best suit your lawn, some basic criteria need to be considered. First, determine what type of soil you have. Kentucky Bluegrass and Perennial Ryegrasses like a fertile, well- drained soil. Neither will do well on sandy, light soils without adequate fertilization and supplemental water during hot, dry periods of weather. Also, soil pH for both of these species is best when between 6.0 and 7.0. If acid soils are the limiting factor, fescues do better than other species of turf grass. For lighter, sandy soils, the fine-leaved fescues do best under low fertility and low water conditions. Turf-type tall fescues may work best in high-use areas that will receive no supplemental irrigation. 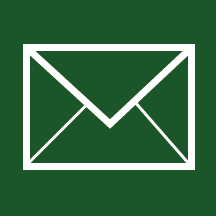 See the UConn Soil Nutrient Analysis Laboratory for information on having your soil tested. Second, are there any physical limitations that exist? Shade is a major factor to consider, as it imposes major problems for most turf grasses. A minimum of four hours of direct sunlight per day is required by the most shade tolerant species- the fine fescue and the turf-type tall fescues. If four hours of direct sun are not available, then some other plant must be considered, as no grass will be able to grow under such poor light conditions. If the shade has enough light to support a fescue species, then two more conditions will determine which fescue to select. Fine- leaved fescues do best in dry shade. Turf- type tall fescues will tolerate damper shade conditions. Poa trivialis (Roughstalk Bluegrass) may also be used in damp shade conditions as well, but may be a last- resort type solution. It is often considered a weed in most lawn situations as it has an aggressive growth habit and may encroach on areas where it will form undesirable patches of light green grass that are difficult to get rid of. There is available since 2013, Poa supina, a Bluegrass from Europe that is used in high- traffic and dense shade areas. It is very expensive, and requires a high amount of nitrogen to maintain it in good quality. Slopes are also difficult areas to keep grass at its best as moisture will be drawn downhill away from the grass. If a fescue does not prove up to the task, consider another groundcover or perhaps a native landscape planting. Also watch for insect damage from cinch bugs, billbugs, or grubs on sunny slopes. Crabgrass often becomes a problem on sunny slopes when other grasses go dormant from heat or drought stress. Third, how much time, money, and effort do you want to spend on a lawn? Fine- leaved fescues require the least fertilizer of all the cool season lawn grasses. Kentucky Bluegrass may need de- thatching every few years, and like ryegrass, needs more fertilizer and water than the fescues. Over-seeding may need to be done on occasion to allow thinned lawn areas a means of filling in and preventing weeds from getting a foothold. A dense, well- maintained lawn kept at a height of 2 ½ - 3 inches will be able to withstand not only weed invasion, but stretches of heat and lack of rainfall longer than a lawn that is cut shorter. If the desire is to limit fertilizer applications, then Kentucky Bluegrass and perennial ryegrass should not be used, as returning clippings alone will not supply enough supplemental nitrogen to maintain a strong turf stand. A species suited to a low nitrogen, low water environment is fine fescue. Fine–leaved fescues are often mixed with Kentucky Bluegrass and perennial ryegrass to provide shade and drought resistant turf qualities. 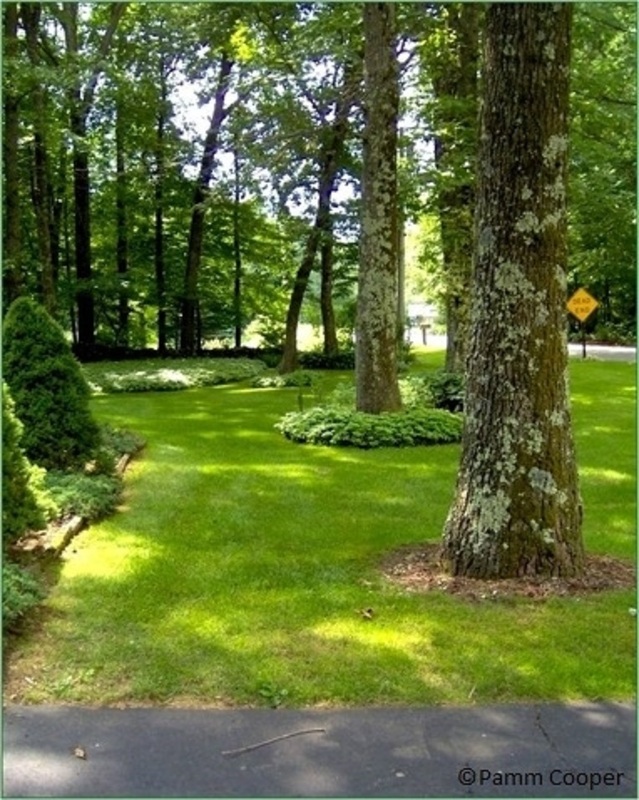 They can also be found blended together using creeping red, Chewings, and hard fescue cultivars for people who desire an acceptable lawn with lower maintenance level. Fine fescues need only two pounds or less of nitrogen a year, while turf- type tall fescues do best with at least two pounds of nitrogen a year. Fine-leaved fescue in shade conditions with ground cover in the dense shade. For high use areas, Kentucky Bluegrasses, Perennial Ryegrasses, and turf- type tall fescues will all do well. Keep in mind that occasional aerification may need to be done to alleviate surface soil compaction and seeding may need to be done if there is thinning of turf stands due to wear and tear. Finally, if salt damage is a problem along roadsides and sidewalks from winter salt applications, try seeding these areas with either a fine- leaved fescue blend or a turf- type tall fescue blend, as these grasses are more tolerant of salt conditions than Kentucky Bluegrasses and rye grasses. If a low maintenance grass is desired, and quality of turf is not a primary concern, fine- leaved fescues are the best choice. An adequate turf cover can be achieved under low fertility and higher height- of- cut. If the seeding rate used to establish a fine fescue is appropriate, and the grass is kept at a height of 3 inches, there is usually a minimum of crabgrass invasion, and the established grass may remain green even during a drought. Fertilize according to recommendations indicated by a soil test, remembering to use a maximum of 2 pounds of nitrogen per 1000 square feet per year for fine fescues. If clippings are returned, one pound of nitrogen per 1000 sq. ft. per year should be sufficient. A lawn should ideally be just one aspect of the entire property surrounding a home. Reducing lawn areas by planting native shrubs, groundcovers, and flowers, and even allowing some areas which are rarely used to become naturalized are a few options for property owners. Areas that are unsatisfactory every year should be evaluated. Poor soils should be amended, insect problems should be identified and corrected when possible, and turf grass species may need to be changed in some areas. If all that fails, consider a suitable alternative planting or a landscape.